A big thank you to Eddy for taking the time to talk to me after our game. Check out all of the games at The 13th Room, especially Chapter 2. We had a great time!!! Playing this Baker Street Mystery game was a throwback to the early days of escape rooms. It was the type of first gen game that would’ve impressed up when we started playing escape rooms, however felt a little lackluster now. We ran into a few small glitches in the game. There was a problem with one of the puzzles not working as well as it could physically that caused us to waste some time and get annoyed. The final lock was jammed. Honestly my biggest problem was the final puzzle’s logic, it felt misleading. Everything else was fine. They did have one really clever puzzle I hadn’t seen before, but it didn’t really fit the decor of the room as well as some of the other puzzles. The room looks nice, nothing fancy but certainly clean and well kept. If you’re in the area I would say check it out. I’ve never been particularly interested in dinosaurs, but I heard about Jurassic Planet and my curiosity got the best of me. I’m glad it did. For only a small $5 up charge to your fair admisssion you can walk among 40 life sized realistic animatronic dinosaurs. It pretty darn cool! 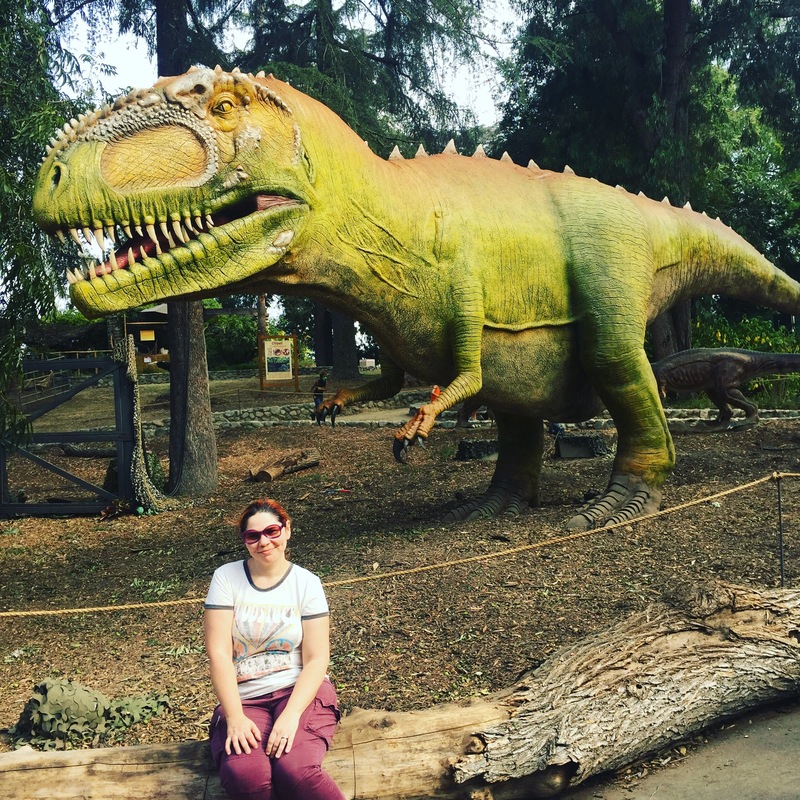 I know they aren’t actually real dinosaurs (except for a few live creatures on display such as an emu, alligator and tortoise), but they seem pretty real if you let your imagination run wild. I found myself wanting to pet them and at one point talking in “baby talk” to a few adorable animatronic baby dinos. I really enjoyed Jurrasic Planet and wanted to share it here. I also recorded a bit of my experience which you can watch from YouTube below. I love going to haunts and Halloween themed events all year, but I go a little crazy during haunt season (late September through early November). Here is a list of the events and haunts I attended in 2016 in no particular order. Unlocked Escape Room is a truly magical experience. It is located in Orange County, California. The story is based around a stage magician, so there are some very unique props and decor in the game. The puzzles are well thought out and the flow is good. I happen to be partial to the magical theme. I am very impressed with the way the theme integrated the puzzles seamlessly. I am also pleasantly surprised at the amount of magic effects included in the game without giving away too much as far as magicians secrets are concerned. All of the puzzles were logical and challenging enough for both experienced and new players. Some of my favorite puzzles in this game were really simplistic in concept, but still created “aha moments” even for us as experienced players. The game is fairly linear in structure. It’s a lot of fun and I highly recommend it. There is a minimum of 4 people for gameplay, however they made an exception and allowed my husband and I to play without additional teammates and we were able to escape. We have both played over 200 games, so we had experience on our side. Overall, this is a wonderfully designed and fun game. Thank you to Unlocked for hosting us to experience your wonderful escape room game. Watch the YOUTUBE interview here. I want to start off by letting you know that Escape Hotel offered free tickets to the general public on their website to play the Jack Reacher game for beta testing purposes and I that is how I booked tickets for this experience. I didn’t know anything about Jack Reacher going into this escape room experience (aside from Tom Cruise being in the movie) and I didn’t learn anything about the story from playing the game either. I would recommend at least watching the movie trailer before playing the Escape Hotel’s Jack Reacher room if you want some idea of what the story is meant to be about. There isn’t really any story given to you for gameplay, however I think it’s assumed that the story is there from players’ prior knowledge of it. My team did mention that they didn’t think the room had anything to do with the movies aside from familiar faces in pictures used in some of the props. There is a video at the beginning of gameplay outside of the rooms we were locked in with the mascot of Escape Hotel talking, but I wasn’t really able to hear it because it wasn’t loud enough. That video might have given some of the information I was looking for, but alas I don’t know. There was an attempt at immersion through the use of blindfolds and environment, but it would have been much stronger if the story was made clear. The room layout was interesting. We started out blindfolded and were placed in three different cells where we worked to escape our small cells into a larger room to work together to solve the final objective. It was unclear to us that the objective was not to escape the room. Since we entered blindfolded, later in the game I accidentally opened the exit door while exploring because I didn’t realize it was the exit door. Puzzles. There were a few puzzles in the room. I hate to be too critical of puzzles since this was a beta test situation. I always try to be forgiving of small glitches and tech issues when testing a game prior to ticket sales opening up to the public and in this case we only had one, so I won’t elaborate on that. I will say that the room has some tech and I assume it will work wonderfully once the room is officially open for ticket sales. There weren’t very many puzzles for the length of the game. They all seemed fairly simple aside from one major puzzle that stumped our group until we asked for a hint. Once we were looking in the right place, we easily understood the rest of them. Sometimes I am not sure if it is fair to say that puzzles are easy when I am playing with experienced teammates because we’ve been exposed to so many different puzzles. However this time, along with my husband and a friend, I had two random teammates that had never played an escape game before and they didn’t have any trouble with the puzzles either. Again I want to stress that since we played during beta testing, it is very possible that the puzzles will change or more puzzles may be added to the game. The rooms decor was not as elaborate as I expected. One of my favorite things about Escape Hotel is the amazing lobby. Unfortunately the beautifully themed lobby is not a reflection of the decor in the games that I have seen at this location including Jack Reacher. It was rather plain and parts of the set dressing was already falling apart. The props looked a little more like handmade craft projects than professionally designed props. It’s disappointing that the game itself isn’t more elaborately decorated since it seems the purpose is to promote the movie and give customers a “Hollywood” experience. This game is a ticketed game, meaning you buy a ticket and may be playing with random customers that also bought a ticket. Normally I dislike playing with strangers, but our team ended up being a lot of fun. There were five of us, which was more than enough to play the game. There were times where there wasn’t really enough for all of us to do. I will say we had fun playing the game together though. We escaped in time and then waited for the game master to come congratulate us. She did not, so after an uncomfortable amount of time we exited the room ourselves and made our way back downstairs to retrieve our phones from the lockers behind the check in desk. The receptionist called the game master on her walkie talkie and she came out and apologized for not coming up to get us and explained that there is a blind spot in the room, so she didn’t know we had escaped. 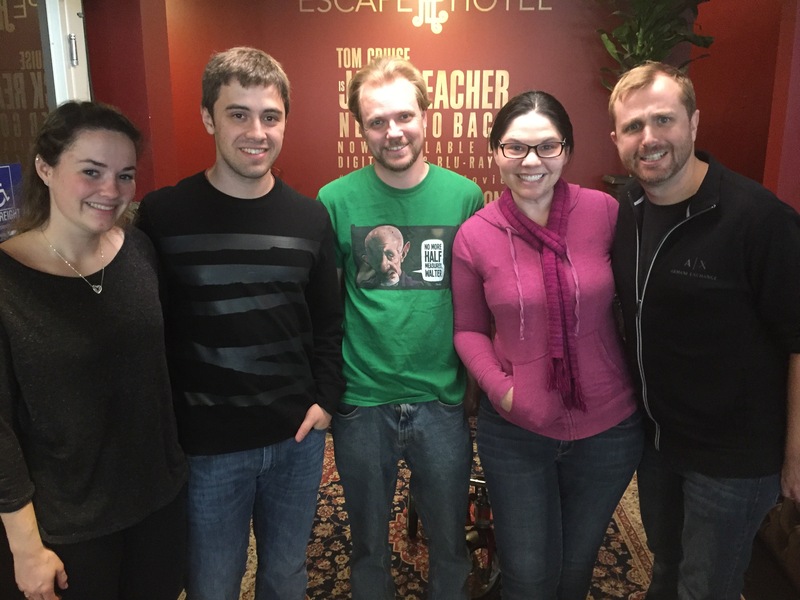 If you haven’t played an Escape Hotel room before, be prepared to arrive 30 minutes early and fill out a waiver and create your passport. Also leave plenty of time for unexpected traffic and parking. There are paid lots nearby and some street parking. This location is also easily accessible by metro. I can’t stress enough that this experience was a FREE BETA TEST and may or may not reflect the experiences of those that pay to play the Jack Reacher game once they officially start selling tickets to the public. I am curious to hear from others that play the game in the future to see if it has changed. If you play Escape Hotel’s Jack Reacher please leave a comment here on this blog post or on my YOUTUBE video for it.